Does anyone know if there are some kind of tax ramifications of selling off tons of coins my dad acquired over the years? In the aggregate they will be worth a significant amount just because there are so many of them. Most, though, are proof sets or uncirculated coins from the '60s and '70s. I made a small sample list, checked some prices online, and found that (probably) very few are even worth what was paid for them, once inflation is taken into account. Do coin dealers report sales to the IRS? Or is it just cash on the barrelhead? Would the amount we get all be taxable as capital gains? Is the basis now the value at the time of my dad's passing? Should we hang onto them until it comes time for my sister & me to inherit them along with the rest of my mom's stuff? Since for most there seem to be no receipts there's no way to prove what was paid for them..
Also, any advice as to the best way to shop them around would be welcome.. None of us have any numismatic experience. You need a tax specialist and a coin dealer that does appraisals. Unless I'm mistaken you get a step up in value of the collection as of the time of death and inheritance, and you get the coin dealer to do a "fair market value" appraisal, which will probably be higher than what you can actually get. Then you sell the collection for what its worth, which is probably closer to an insurance companies 'replacement value', and take the 'loss' against your personal gains. Oh yeah, one other thing...collectibles are usually referred to as "tangible personal property" for tax purposes, some googles of that and 'inheritance' or 'estate' and 'taxes' should give you both federal and state implications. My parents had a coin collection.. to sort it out was a pain even when few items were pocket change. Those who collect coins should do so for enjoyment, not investment. you get the coin dealer to do a "fair market value" appraisal, which will probably be higher than what you can actually get. I get the feeling this coin "collecting" was very popular a few decades back, along with "Franklin Mint"-type items and "first day issues" of stamps... maybe for a generation that started out with very little yet wanted to pass something "of value" on to their heirs. ?? * I wonder if these things still sell as well today. Franklin Mint stuff is popular on eBay but most sell below original costs. I wonder if these things still sell as well today. I've dabbled in amateur coin collecting and bought most of my grandpa's collection from my grandma when grandpa passed away (so grandma would have money to live on ). I paid a little over what the silver bullion would bring if you melted it down. That's what I found to be the wholesale price that dealers would pay for a bulk collection. I've heard the mint proof sets are frequently worth only face value. You may be able to ebay them for a little more, if you have plenty of time. Maybe the best way to value it if you're going to sell it is to see what ebay would get you, and shop it to a few local dealers. I contacted a few dealers when I was trying to get rid of my grandpa's collection for grandma (before I bought it), and most didn't even care to look at it, or told me the wholesale price they'd pay. The bulk of it was 50-75 silver dollars from the 1880's to the mid 1920's (hoarding silver coins was probably depression era thinking). 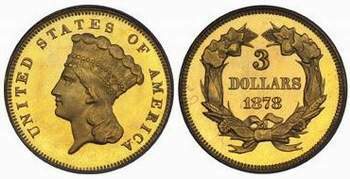 I think they were only worth $300-400 back then (I think I paid $6 per coin?). Since then the silver market has skyrocketed. I'd rather own it myself and have a memory of my grandpa than have silver dealers melt it for bullion or have some ebayer sell it off. It's small and easy to store too. I am not sure if this is a common tradition, but I remember now that I had gotten some silver dollars as a child, in particular along with the gift of a pocketbook or wallet. About 2-3 years ago my sister gave me a wallet. I didn't need it and so I stuck in in the back of a drawer. It was only last month that I picked it up and relized there was a silver dollar inside (now all tarnished, of course!). * * I think you're right, Justin. My mom had a small collection, and one of my aunts used to give me a silver dollar at the end of the school year. * I also remember than either in the late 70s or early 80s, the price of silver went up quite a bit, and that aunt (living on SS by then) happily sold her collection. I also remember than either in the late 70s or early 80s, the price of silver went up quite a bit, and that aunt (living on SS by then) happily sold her collection. In 1979 the sons of patriarch H.L. Hunt, Nelson Bunker and William Herbert, together with some wealthy Arabs, formed a silver pool. In a short period of time they had amassed more than 200 million ounces of silver, equivalent to half the world's deliverable supply. When the Hunt's had begun accumulating silver back in 1973 the price was in the $1.95 / ounce range. Early in '79, the price was about $5. Late '79 / early '80 the price was in the $50's, peaking at $54. Once the silver market was cornered, outsiders joined the chase but a combination of changed trading rules on the New York Metals Market (COMEX) and the intervention of the Federal Reserve put an end to the game. The price began to slide, culminating in a 50% one-day decline on March 27, 1980 as the price plummeted from $21.62 to $10.80. * * the Hunt brothers .. now there's a blast from the past* * Well, at least my now-departed aunt got some benefit. * Thanks for the reminder! U.S. Gold Coins are very Valuable and I love to look at them. I'd drive myself nuts collecting them, so I don't even want to buy one of them. I'm afraid I'd become compulsive about them. But they sure are Pretty! Collecting coins and stamps are fun. But if consider these investments, then just buy one or two very expensive pieces. Its hard to call it collecting, but these have a much better chance of going up in value. Be thankful your collection is a coin collection not a stamp collection. The value and disposal of stamp collections is far more complex than that of coins. Coin dealers won't normally report sales to the IRS, but their paperwork (and your sales receipt) will be available to the IRS if the dealer is ever audited. The IRS audited alot of coin dealers for the time period when the Hunt brothers were cornering the silver market. I've collected both US stamps and coins. I think I know what your talking about. Stamps have more variables that effect value. Condition, gum, fakes, etc. This also make it more fun to collect. I just find it hard to get excited about a shoe box full of slabbed coins. The basis issue sounds kinda messy. * Did you have to file estate tax returns for your dad? * If so, then his assets should have been valued at that time. * The question is whether the collection was joint with you mom or his alone. * If his alone, your mother's basis is the value at his death. * If joint, it gets messier. It could be that his half may have the step up at his death to the value at that time and her half be what was paid for the coins. But I am not sure. I have some vague recollection of jointly owned property getting a step up for the entire value when a spouse dies. . . but I just can't remember. LOL or retire@40, do you know? If you mother just hangs on to them, the whole collection will get a step up in basis when she dies and you won't have to worry about lack of records. Collectible gains are taxed at a higher rate than other capital gains: 28%. Martha, thanks for the detailed response. I have a feeling they were not catalogued.. just squirreled away in the basement. I think, indeed, that they were purchased with some in his name, some in mom's, some in my sister's, some in mine, etc. ... just to make the whole thing more confusing as over time some of the mailing boxes have gotten tossed (by ignorant yet well-meaning cleaner-outers.. i.e., me!). Sounds like the thing to do is wait and deal with it in the future with the stepped-up basis. Even if the worst were to happen and somehow someone came to understand that a small portion of this "collection" were actually mine, again, I think the value has been substantially flat over time. If we were talking about serious rarities and not 1970 proof sets I might be concerned about collectible cap gains, though, so that is good information to have!